Directing traffic: Charlie's Playhouse has moved! My beloved Charlie's Playhouse has evolved into something new: Evolution for Kids! If you're following this blog, please move on over to the new, refreshed version at evoforkids.blogspot.com! Imagine you are five years old. Come on, feel that crayon in your hand. 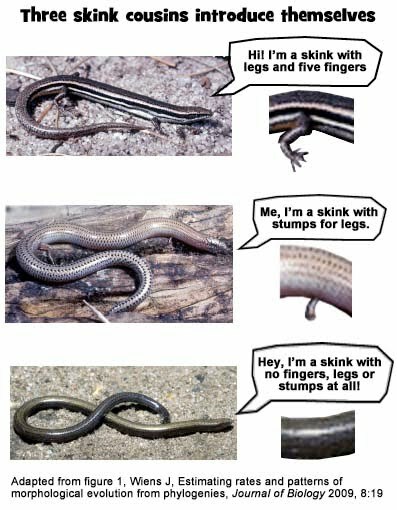 One day, your mom tells you about lerista skinks, these Australian snakes that used to have legs but evolved to lose them. This evolution happened so fast -- only 3.5 million years! -- that there are still several old species of skinks crawling about, some with complete legs and toes, some with fewer toes, some with just stump legs and so on. It's a living parade of transitional forms. The crayon gets itchy, doesn't it? You want to draw some skinks, right? Well, that's what happened with young Safa, the winner of our Evolution & Art Contest in the 4-6 age category. When Safa heard about the skinks from her mom and about the contest from us, she put everything t ogether brilliantly. Instead of four-legged lizards evolving into legless snakes, she imagined the reverse: snakes evolving to have legs. What kind of environment would lead to that? She picked up her crayon, expertly. Her entry has two panels. The first shows the original snakes in their grassy environment. The second, helpfully labeled as "one million years" later, shows the evolved four-legged lizards in a rocky environment where legs make it much easier to move around. Perfect! Here's our interview with Safa. Kate from Charlie's Playhouse: I love your evolved snakes! How did you come up with the idea of using snakes and moving them to a rocky land? Safa: Mom showed me a picture of lizards turning into snakes, so I decided to turn snakes into lizards. I wanted to do something with legs, and rocks are hard to slither on. Kate: Your snakes evolved in three ways: color, antennae and legs. How did you think of these? Safa: I chose gray because it is easier for them to hide and the cave is gray and the cave is their home. I chose antennae to help them if they fall on the rock. I chose legs, so they could walk on the rocks. Kate: You know a lot about evolution, especially for someone who is just five years old! Where did you learn about evolution? Safa: From a library book and some things my mom told me. Kate: Do you know who Charles Darwin was? If you could travel back in time and visit with him, what would you like to ask him? Safa: I have a book about Charles Darwin but I haven't read it yet. I would ask him things about evolution, snakes and tigers. Thanks, Safa! You've got a great imagination, and a great future in art and science. We got fifty entries to our Evolution & Art Contest. The competition was fierce, it was dog-eat-dog. In the 7-9 age category, our judges had a magnificent clown fish, stick insect and snow grouse to choose from, among others. In the end, Delaney's monkey charmed everybody. Delaney is nine. For her entry to the contest, she imagined that some monkeys got stranded on an island with a different environment than they were used to. Their new environment had "hard nuts, quiet predators, and purple bushes and trees." What would happen after, say, a million years? How would the monkeys evolve? 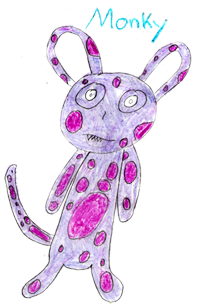 Delaney's evolved monkey has sharp teeth (to crack the nuts), huge ears (to hear those quiet predators) and purple polka-dots (to hide in the purple foliage.) Perfect examples of adaptation! Kate from Charlie's Playhouse: How did you come up with the idea for your contest entry? Delaney: Well, I made up my island first. I thought it could be anything at all. I knew it had to have a different habitat, different food and everything for the monkey. Then I looked at what the island had and saw how the monkey could blend in. I added the adaptations. Kate: Did you think about using another animal? Delaney: Yes, I thought about a flamingo or a pig. A flamingo would be hard. It might have changed its legs so it could run faster. A pig would be like a vampire pig because it would get the sharp teeth! But I really liked the monkey. It was easier to adapt because it has a lot of features that are able to be changed. Kate: How did you learn about evolution? Delaney: My dad started telling me about it. I got really interested, and I asked questions. When I ask my dad a question, I always get an answer. Also, once after a trip he brought back your Giant Timeline, and I like to look at it. He also tells me what other people say about evolution, like at the dinner table. Kate: Cool! Last question. If you could travel back in time and visit with Charles Darwin, maybe go to his study and have tea with him, what would you want to talk about? What would you ask him? Delaney: I would want to ask if he knew he wanted to be a scientist when he was a kid. Did he have the idea as a kid? Also I would ask about all the stuff he saw on his trip: what he saw in the ocean or something flying or what he thought was interesting. What he thought about those birds with the different beaks, and if he thought that was evolution, or if he would have to think about it. Kate: I wonder if he knew when he was a kid. What about you? Do you know what you want to be? Delaney: I want to be a paleontologist or archeologist. You get to see the animals of the past, and the fossils are actually their bodies. It's like looking at them alive! I love this part about the finch beaks: "if he thought that was evolution, or if he would have to think about it." Yes, he did have to think about it. He had to think about it FOR TWENTY YEARS. That's a long think. 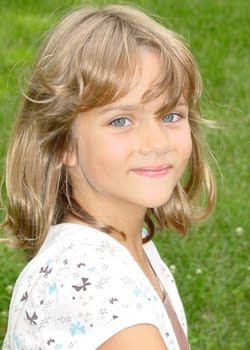 Here's the story of a kid who truly, deeply loves biology and whose parents have been wise enough to get out of her way. Prepare yourselves, people, the kid is amazing. Abby discovered biology as a tiny tot, when she fell in love with David Attenborough documentaries, especially one featuring disgusting parasitic insects. Go girl. 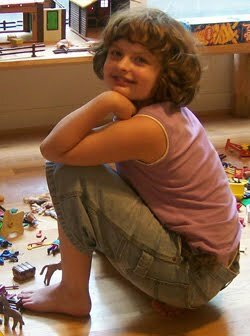 Her pretend play with animals soon filled up with biological jargon so thick that her parents couldn't understand what the heck she was talking about. Now she is taking a biology course on the late high school/early college level. Yes, she is 11. 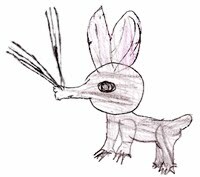 Welcome to our interview with Abby, winner of the Evolution & Art Contest in the 10-12 age group. Kate from Charlie's Playhouse: We loved your entry about the star-nosed moles! Abby: Thank you. I did a bunch more entries too, but I chose the moles. I've always had a "thing" for star-nosed moles. They're cute! I also did a water buffalo, a kangaroo and a polar bear. 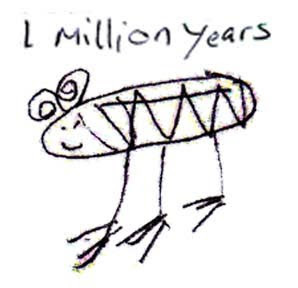 Kate: Oh, so you evolved all those animals in your mind and drew pictures of them? Abby: Yes. I like to play a game with my mom when we're walking together. She names an animal and I evolve it for a new environment, usually to make it cuter. So it's easy for me to think of how animals evolve. I did the star-nosed mole with her one day. Kate: How did you first learn about evolution? Abby: Well, I was a dino freak when I was little. I knew all the dinosaur names, and I loved the little mammals that lived with the dinos. I wanted to learn how the little mammals from that time came to this time. Kate: So what did you do to learn about that? Abby: My dad would go to the library and get a bunch of books on mammals and evolution. Then I would draw them all. I realized that I could take every one of those mammals, and just using the powers of time and adaptation, I could make a totally new animal! Kate: Cool. Can you give me some examples? Abby: I like to imagine a domesticated fox, mountain lion, and prairie dog. They get cuter when they're domesticated. Kate: So let's see. They're wild animals, and you imagine how they might evolve to be domesticated. So what's their new environment? Kate: Oh, nice. So do you know what natural selection is? Abby: Of course I know what natural selection is! I'm taking a high-school biology course! Also I'm such a book-lover, I read about it all the time. Kate: OK, last question. Let's imagine that you could travel back in time and visit with Charles Darwin at his home in England. You're having tea in his study. What would you want to talk about? What would you ask him? Abby: Oh! I do that a lot, travel back in time in my mind to talk with people from history. Mostly with Jefferson. Kate: Really! So what about Darwin? Abby: I would ask him how much courage it took to actually get his ideas out into the public. To think that far away from the mainstream. That's what I admire about him. Kate: Anything else you'd like to add? Abby: Yes, I have an imaginary world where all my made up animals live. I'm a scientist in that world, studying them. I have radio collars and video cams on nine of the animals, and I collect information about them. The males have some terrifying fights over food and territory! So there you have it, folks. She's collecting data from the field. Abby, we await your findings! P.S. Parents tell me that entering the Evolution & Art Contest was a fun learning activity even apart from the contest. So feel free to grab a kid, download the instructions here, and see what happens! We're always delighted to see kids' work if you'd like to send it in.